This week, the Church moves from the feast of Christmas to the feast of the Theophany – the celebration of the Baptism of Christ. The intent of this feast is not to celebrate a succession of historical events (the Baptism of Christ is at least 30 years later than His birth). Rather this feast takes us into the depths of the mystery of Christ and His salvation of the world. Many Christians, reading the gospel accounts of Christ’s Baptism, are not sure what to make of the event. They accept Christ’s own explanation to St. John, “It is necessary to fulfill all righteousness,” though they are not entirely sure what He means by this. They have no particular understanding of why Christ submitted Himself to this action of John (it was not required by the Law – but is rather a prophetic action on the part of St. John). St. John himself does not seem to understand the purpose of Christ’s Baptism. He is told that “whoever you see the Holy Spirit rest upon and remain” is the Messiah – but he is given little information beyond that. Witnessing Christ’s Baptism and the Spirit resting upon Him, he hears the voice, “This is my beloved Son in whom I am well pleased” (Matthew, Mark and Luke all bear witness to the voice). The Church later celebrates this manifestation of the Trinity (Christ in the water, the Spirit descending, the Voice of the Father – hence the title “Theophany”). I sent you an email a few weeks back in regards to a new book. Just wondering whether you received it as had some issues with attaching? ….interesting post Father Stephen…I appreciate the fact that in your posts you frequently point out for us the ‘other’ meaning behind the literal text as you described:..”all shared a common sense that there was something behind or beyond the text that confronted them”..for me this entails a necessary bit of mysticism which i dont think most individuals are capable of without the practice of Hesychasm..otherwise it could easily lead to Gnosticism..imo…….also I loved this:” The world and all that is in it is given to us as icon”…man..thats good! Dear Father, bless! Thank you for this post. I never tire of hearing/reading this truth, but it really takes the Holy Spirit to understand it. Mike’s right–some will understand it in a gnostic way, but that is all in God’s providence. The bottom line is clear, and you have underscored this: Everything (whether in Holy Scripture or in Creation) points to Christ and His Pascha, and nothing can be properly understood (or understood in its true depth and spiritual meaning) apart from Him and Pascha. Joyous Feast to you and to all! It is grace and wisdom from on high that enables us to see the fingerprint of the Almightly in all of His creation; to see His fingerprint even beyond what is written. The priest who wrote the Akathist of Thanksgiving titled “Glory to God for All Things” considered to be Gregory Petroff, gazed in wonderment at all of creation. Never had I encountered a soul that was able to express as a master wordsmith, the beauty he so deeply appreciated in God’s creation, before hearing his akathist. I don’t doubt that many of God’s children have had similar experiences but have not written them down for posterity. I had one such experience when visiting the Grand Canyon. As I walked toward the canyon at sunset for the first time, viewing the panoramic view of colors, sounds, and smells, tears welled up in my eyes. I was speechless! One of the persons I was with also had a similar experience and attributed such inexplicable beauty in creation to the Artist, that is God, saying man could never create such beauty. An icon worth a thousand words, thanks for this Fr. Stephen! A friend just loaned me a book to read entitled, “A Guest in God’s World. ” According to the author, this phrase was coined by two Benedictines several centuries back, Kevin and Bridgette. Reading the above essay and comments I put the two together. We live in God’s world, He is the host, and lots of times we do not even acknowledge who he is even when He goes out of his way to get our attention. (From Mother Gabriella’s Lenten lectures available on AFR). Could you say a few words about the (particular) icon that accompanies it? And so the pseudo-scientific theory of evolution is so destructive to modern man. It infers that every thing is impersonal, that nothing can reference something else in creation, and that there is no meaning. It is counter intuitive to every thing Orthodox. And yet so many give it a place in their thinking. Going to elaborate lengths to excuse it. Love should compel every Orthodox to resist it to the uttermost for the sake of his fellow man. But instead many try to show how “enlightened” they are by making allowances for it. Inventing destructive heiresses that give it cover. Right, in absence of an answer, i tried to search about the icon used for the post on the net without result. It seems certainly greek from the inscription. I asked because i was intrigued by the technotropy and certain features like say the heavens/background depicted black, and wanted to know why that is. I do not remember the name of the particular iconographer, but it is Greek. The darkness is particularly effective. Christ’s entering the waters is also an entrance into Hades (thus Theophany is a little Pascha). This icon very effectively portrays that. The gates of hades (in the shape of a cross) are beneath Christ feet, much as in the Pascha icon. The “snakes” are the “dragons whose heads are crushed” mentioned in the Psalms who prefiguring Christ’s defeat over the enemy. It’s an extremely rich icon. Sorry to be late in answering. I’ve been both sick (some sort of very nasty cold) and very busy in my parish life – thus little attention to the blog for a couple of weeks. No worries, thank you for the reply; hope you get better soon. Thank you for another thoughtful post. What of the significance of the two small figures in the waters? My son is asking, we haven’t been able to find much on them. Hope you are well soon. In Christ. It seems that it was originally a 6th century mosaic in the St. George’s Church in Madaba, Jordan, that is famed for its Byzantine era mosaics. 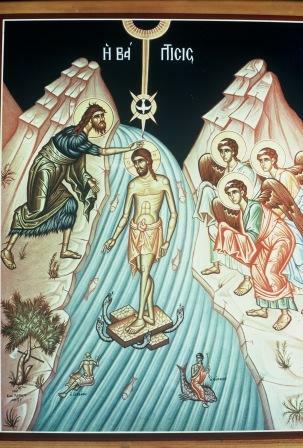 The icons of Theophany and their content reflect the Church’s understanding of Christ’s Baptism. Even a 6th century mosaic shows how ancient such a perception was. The same thing can be seen by reading the text of the festal menaion for Theophany (which is not easily found online). Could you explain then, how can you tell then from reading the menaion? I am including the 2 Canons (9 odes) from the Vigil for Theophany. It is a wonderful poetic form found in the vigils. Using references and images from the Scriptures it offers a theological reflection (that is sung). Such passages in the services are probably the verbal equivalent of icons with the richness and variety of content. There are subtle interplays that take place within them. 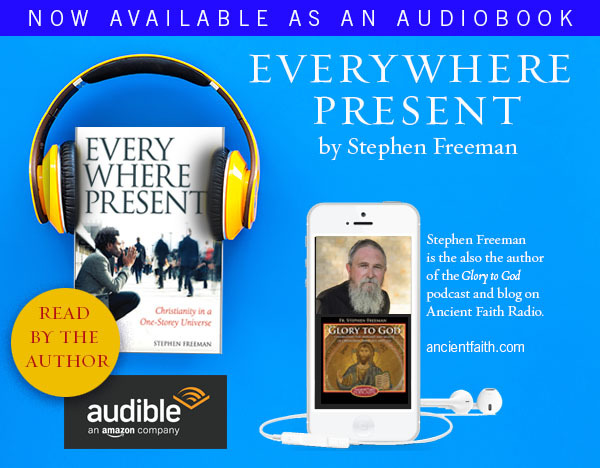 Each ode is a development of a Biblical Ode (ode one is a poetic echo of the Song of Moses in the book of Exodus – the 9th ode echoes the Magnificat of the Virgin in the New, etc.). The richness of the whole is much like an icon – though expressed in words – the words carry references and allusions that themselves become part of the canon, though unspoken. and on the dry ground drew His people out. But his enemies He covered in the deep. is Himself cleansed for their sakes in the Jordan. By His own will He became like them while remaining what He was. which was turned into dry land. by the might of the Master’s right hand. and cleanse creation from all filth. who was buried with You in the waters. He exalts the horn of His Anointed. and comes to be baptized. Rejoice today, O Church of Christ! through water and the Spirit. Who delights to give us gifts! by striking the Master, the Dawn that has shone forth. The Master draws to Himself the nature He created. Though it was overcome by tyrannous greed, He begets it anew. He brings His greatest work to completion. For He came wishing to defend it. carrying us up to the heights of heaven. preserve us, O Christ God, and have mercy on us! and bore witness to Your Son. “since it is by nature bright? the express Image of the eternal Father? And how can I who am but grass touch the fire of Your divinity? he immediately turned away his gaze. How then can I look openly upon You? How can I lay my hand on You? For You are Christ, the Wisdom and the Power of God. I yet respect the things which have no soul. and this very Jordan that turned back. the Prophet praises the renewal of mortals. Who has shattered the might of the strong. radiant children from the streams of the Jordan. though in the flesh He came after me. God the Word hunts in the lairs of dragons. and overthrows the one who bruises the heel of the human race. and leads it to the pastures of life. came to free from condemnation Adam, the first-formed man. yet for the fallen He is cleansed in the Jordan. and grants peace beyond all comprehension. “You brood of vipers, who warned you to flee the wrath to come? to the wheat He grants eternal life. except by those who are reconciled by God to Himself. the Maker raised him up and laid him on his shoulder. the shameful disposition of old Adam. and gently heals the sickness of the world. without corruption is made flesh from the Virgin. the thong of His sandals, the bond between the Word and us. He delivers those born on earth from falsehood. those who do not know Him as God. those who acknowledge His divinity. He delivers them from their faults. Whom He had brought forth from the womb. “Truly,” he said, “this is My Son Who shares my nature. swallowed up in the belly of the sea monster. deliverance on the last day from the man-eating dragon. marvelously descend in the form of a dove. He revealed the Master to the people, that they might run to Him. Christ, the great Light, has shone. shining like lightning from Bethlehem. sheds His rays on the whole universe. let us clothe ourselves in Him, that we might be warmed. the holy Youths walked in the fiery furnace free from harm. the angelic powers stood by the Jordan. He is the God of our fathers. by the cloud and the sea through which the people passed. In them the people were once baptized into Moses the lawgiver. The sea was a type of the water and the cloud a type of the Spirit. and with the Angels let us glorify Father, Son and Holy Spirit. and He burned the heads of the dragons in the waters. all the blindness born of sin. who entices us to the path of destruction. the people of Israel crossed on dry land. to a better and changeless path. for the salvation and welfare of mortals. and encompassed the Creator when He was baptized in the flesh. Him the peoples bless and highly exalt for ever. “Put away all fear,” said the Redeemer to the Forerunner. “Obey Me and come to Me, for I am good by nature! and, trembling, he stretched out his hand. Whom the peoples bless and highly exalt for ever. and those who were in darkness are made children of light. Only the prince of darkness groans. now eagerly bless Him Who has brought this about! to consume all deadly error with a fire of dew. for now it is raised from its fall from heaven. by the Word Who preserves all things. more honorable than the heavenly hosts! even angels are overcome with awe praising you. for you know our love inspired by God! You are the defender of Christians, and we magnify you. Magnify, O my soul, Him Who comes to be baptized in the Jordan! “Draw near to God in faith and be enlightened! and in these streams restored the broken man. Magnify, O my soul, Him who receives baptism by the Forerunner! Magnify, O my soul, Him who was attested by the voice of the Father! “Wash yourselves,” says Isaiah, “make yourselves clean! Put away the evil of your doings from before the Lord! with the water that gives renewal. He baptizes them with the Spirit unto life that grows not old. Magnify, O my soul, One of the Trinity Who bent his neck and received baptism! O Prophet, come to Me, stretch out your hand and baptize Me quietly! Let us, the faithful, keep ourselves through grace and our baptismal seal! so the divine washing of regeneration will also be an exodus for us. Passing through it, we will see the light of the Trinity, which never sets. for I have come to fulfill all righteousness! Today the Master bends His neck beneath the hand of the Forerunner. the wonders of your childbearing pass understanding. Through you we have gained perfect salvation. and we bring you a gift, a song of thanksgiving. Today John baptizes the Master in the streams of the Jordan. Today the Master buries the sin of mortals in the waters. Today the Master is attested from on high as the Beloved Son. and the streams of the Jordan welcomed Him and were not harmed. Today the Master has come to sanctify the nature of the waters. Today the Master accepts baptism at the hand of the Forerunner. (Repeat: “We now see accomplished….”). and lead it into endless life. Magnify, O my soul, her that has delivered us from the curse! I wonder how the biblical images and references were stitched together. Clearly they go hand in hand with what is depicted in the icon, so one must have followed the other – unless they both spring out of a particular reading of the Scriptures – “theoria” etc that you were talking about in a recent posting. How gloriously beautiful! One could do a study on these Biblical Odes till the eschaton! How worshipful! When were these odes written? I have so many questions about the text swimming around in my head, but for now I will lay them aside to bask in the beauty of such heavenly praise. Darlene, my thoughts entirely. I don’t think I can add one iota to what you’ve said here — thank you for saying it! This particular canon was written, I believe, by Cosmos the Chanter (7th century). He was the adopted brother of St. John of Damascus who also wrote many hymns and canons. They both lived at the monastery of St. Sabba in the Judaean desert. Cosmos eventually became a bishop. The hymnography of Orthodoxy is without comparison. The depths of its theological reflection, use of Scripture, etc., have no equal. The bulk of this material is only heard in a very active monastery in which all of the services would be done every day. I have 12 thick volumes (one per month) at the parish, to provide material for as needed. The books are known as the “Menaion”. There are also the “Festal Menaion” with the material for the major feasts and the Triodion with the material for Great Lent, and the Pentecostarion with the material for the days between Pascha and Pentecost. The hymnographer, Cosmos, also composed much of the hymnography for Holy Week. Μηνας is greek for month – so menaion (μηναιον i guess) is litteraly “the monthly”. 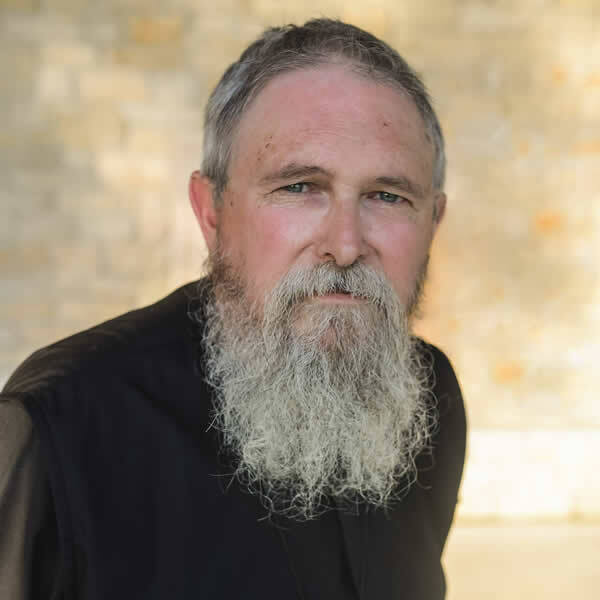 “Christ’s Baptism is a foreshadowing (and on more than a literary level) of His crucifixion and descent into Hades (just as our own Baptism is seen by St. Paul as a Baptism into Christ’s ‘death and resurrection. '” I appreciate your sensitivity to your audience as you patiently explain this interpretation with those of us who are used to looking only for the meaning in the text that the author would have been consciously aware of, or interpretations that assume there is “a” meaning of the text rather than multiple meanings. “Love alone reveals things for what they are…” Amen and Amen.